Despite the seemingly haphazard organization of this site, I try and make an effort to research the cities that I visit. Of course this creates a running list of restaurants that I want to try. That is all well and good, but when it comes to Birmingham, I keep running into the same problem. It seems that that a few of the big name restaurants, Hot & Hot Fish Club and Bottega simply are not open for lunch. Seeing as I rarely eat dinner in Birmingham, you can see how this creates a bit of a problem. Thankfully, there are a few places that have lunch hours and one of those is Café Dupont. Situated in downtown Birmingham, it’s still taken me a good while to make it to Café Dupont. No matter how hard I try, I rarely make it to Birmingham before two in the afternoon. Luckily, this last trip to Atlanta was one of those rare instances and I was finally able to exit off I-20 and take a look at what Café Dupont had to offer. 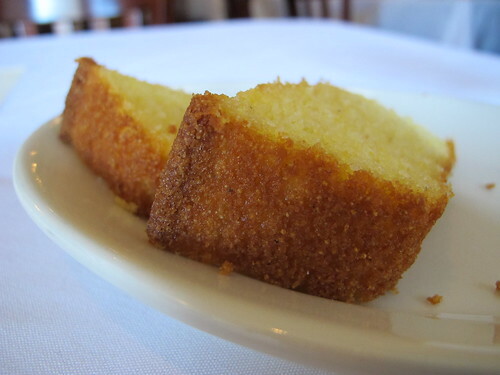 True to their word, the interior of Café Dupont does have the air of a traditional bistro, but how many bistros serve complimentary cornbread? This was a very intriguing cornbread; instead of the dense Southern cornbread I know and love, this was an incredibly light example. 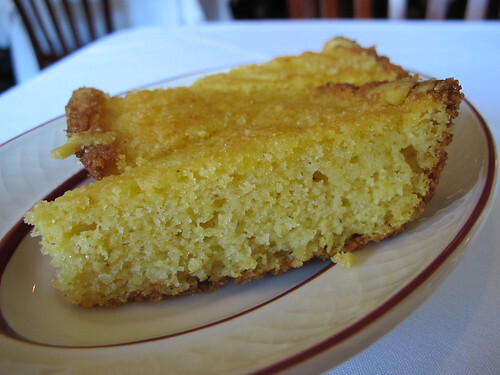 Another feature of the cornbread was an excellent crust that surrounded a salty and slightly sweet interior. It’s far from your average cornbread muffin, but I’m okay with that. 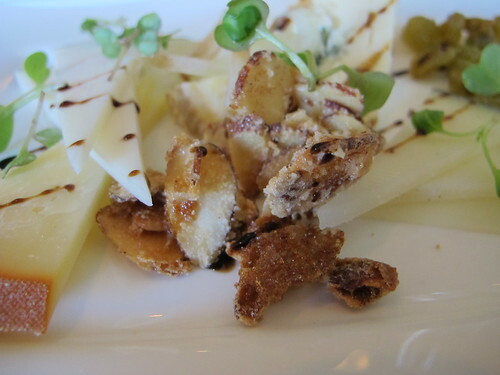 Although the lunch menu had a number of fine salads and a rather inviting dish of Beef Carpaccio, it was the Artisan Cheese Plate that really called to me. According to the menu, this was a plate of Drunken Goat, St. Andre, Manchego, Piedmont, and Maytag Blue, unfortunately this was not the case. While I didn’t get a decidedly straight answer about what was on the cheese plate, I can say that, aside from the drunken goat, the plate was somewhat forgettable. Well, I take that back, the almonds were sweet and quite tasty. 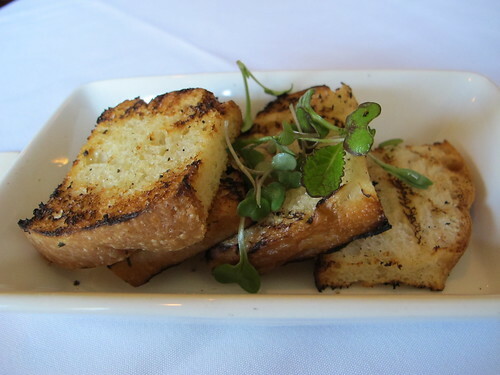 Another highlight was the garlic crostini. It’s a shame there wasn’t more as each piece was crispy edged with a tender interior that was bursting with garlic. 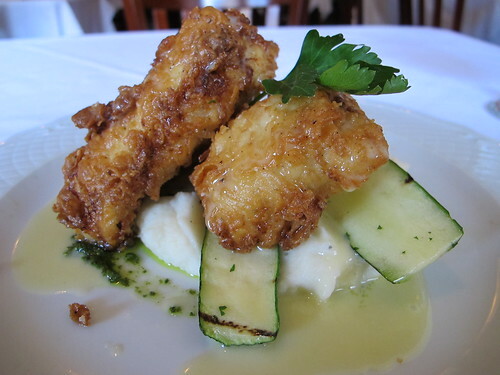 With a menu that changes daily, it’s hard to know which entrée to pick at Café Dupont. Choices like Braised Tennessee Rabbit and Grilled Rabbit Tenderloin or Pan Roasted Flounder are just a few of the offerings for that lunch. Hoping for some guidance, I asked my waiter for a suggestion. When he told me the only constant entree on the menu was the Buttermilk Fried Chicken Breast, my choice was made. 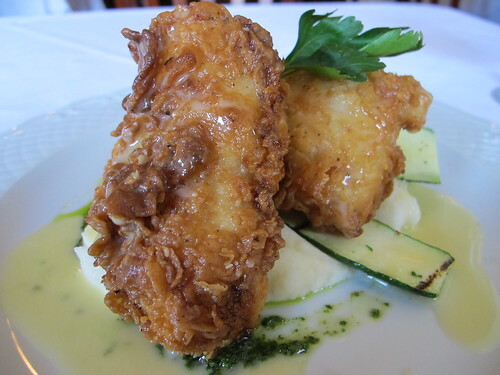 Served with creamed potatoes and lemon beurre blanc, this was certainly an upscale version of fried chicken. If there’s one thing I have to say about this chicken is that it was like striking gold. I finally found a piece of white meat chicken was wasn’t overcooked. This was a beautifully moist chicken breast, but I can’t forget the rather chunky, but extremely crunchy skin. 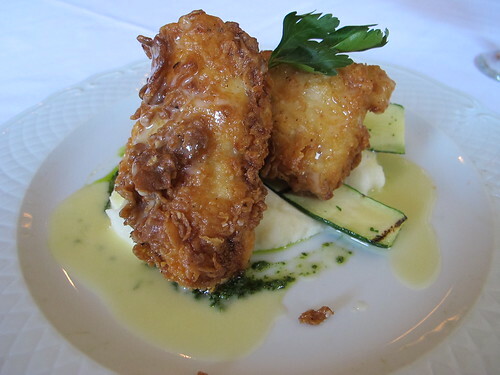 With each bite came a slight tartness from the buttermilk, an effect that was only emphasized by the lemon beurre blanc. Beneath the chicken was a small mountain of silky smooth potatoes that was complimented with a few slices of well cooked, yet crunchy zucchini. I would say that I found the buerre blanc to be a little overwhelming for the dish, but with the addition of a spoonful of basil pesto, it all worked quite well. Given the choice I would have preferred a more salt and pepper to the potatoes and just a little spice to the chicken, but the salt and pepper was easily rectified and the chicken is a personal preference. 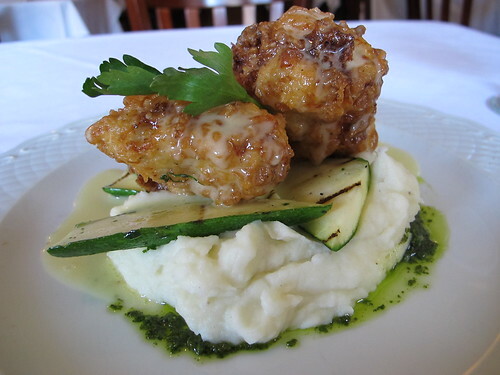 Overall, it’s no wonder that this chicken has a constant presence on the menu, as it’s an excellent entrée. Of course, this leads to Café Dupont on the whole. 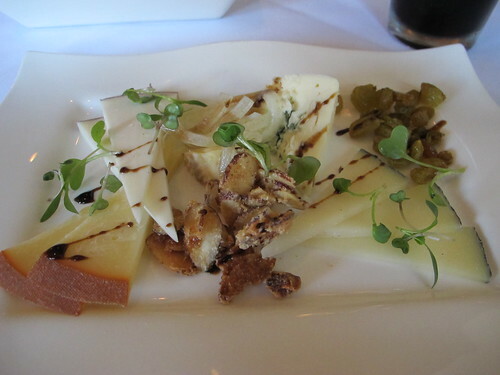 With a daily new menu, excellent service, and superb preparation, I’ll be quick to forget the small problem of the cheese plate and sure to stop by once again.